David Cross is one of the great conversational comics, among a short list of greats. Well, you may have a long list. If a gun were put to my head, and I could cough up, say, only four comedians currently working at this level, I would go with: Sarah Silverman, Chris Rock, Dave Chappelle, and David Cross. They’re all around my age and they’re all very relatable but, more than that, they are all masters at this deceptively simple casual banter that, bit by bit, builds into something epic. I caught The OH COME ON 2018 World Tour at its stop in Seattle, at the Moore Theatre, June 29th and I loved it! Be prepared for some very funny material about being a new dad from a comic known for being jaded and highly ironic. Cross assures his audience he’s not one of those comics that does an hour of dad jokes only to end up doing quite a lot of dad jokes–but they’re very subversive dad jokes so it’s all good. If you’re expecting intelligent humor from an intelligent comedian, you’re in luck here–but also be prepared for it to get pretty weird and crass. The material on Trump is priceless and I certainly won’t give any of it away here. I will say that Cross isn’t kidding when he confides in his audience that making fun of Trump is a challenge. As Cross wades deeper and deeper into the Trump swamp, you can see Cross fighting off the fumes and doing his part for his country. One of the best bits is Cross wrapping his head around the recent trend of regretful Trump voters. It’s a thing of beauty to see Cross rattle off all the things that have had to happen before these Trump voters had regrets. You’ll thank me for including this YouTube video as accompanying material. Out of the blue, so it seemed, Cross jumped into a long bit explaining this very strange Deep State conspiracy theory. The idea here is that true believers are convinced that there’s a vast government scheme to pollute the air and only a vinegar spray can combat it. Enjoy. The actual bit that is the title to his act glides in for a landing at the very end of the show. It’s just one of those special things you have to see for yourself! Again, I will just say: Cross is masterful at articulating simple and goofy material in a sophisticated and artful way. Perhaps one of the best of the quickie jokes was at the very end, just as some people were sharking their way out. There was David Cross, back on stage, with one last bit. Cross wanted to share a very special item he discovered at one of his recent hotel stays. 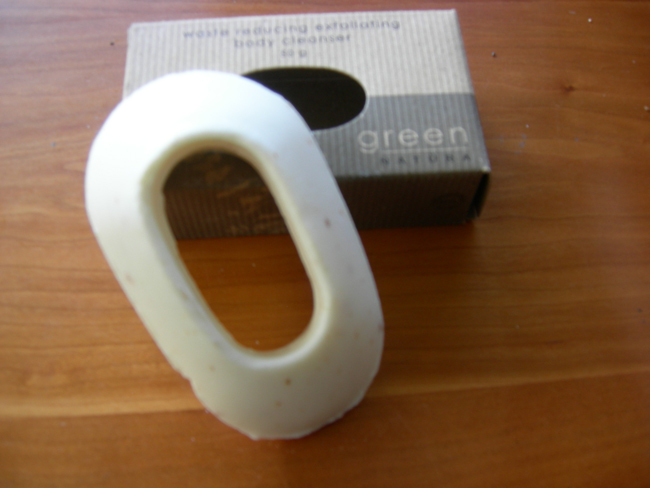 It is a very special “ergonomic” and “sustainable” soap. Just the sort of thing begging to be made fun of. And, to top it of, it has a gaping hole right in the middle. Well, sometimes comedy material just writes itself. Cross was now armed with a hilarious symbol for all he hates about Santa Monica liberals who live in a bubble–and are thrilled to pay premium for soap with a hole where most of the soap should be. The OH COME ON 2018 World Tour is on, baby! Visit the official David Cross website right here.